The Church Offering Count Form below can be used by the appropriate assigned church member such as the Church Treasurer or another designee to count the offering each church service. 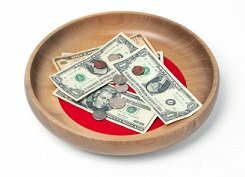 Counting the offering in church should be an organized and systematic process. Still, it should be as simple as possible by using these collection count sheets. Each individual church has their own policies and procedures for counting church offerings, but there should always be at least two people counting the offerings followed by their signatures on the form or sheet.The Church Laws and Regulations require at least two signatures of any two people counting the tithes and offerings per sheet or form. Always file these documents where you can find them at any given time. It is good idea to have a hard copy and a copy on your hard drive or jump drive in case of the unexpected event of the files getting lost or destroyed in some way. The count sheet for church tithes and offerings to the right has a place to record how many of each bill ($100, $50, $20, $10, $5, $1) was received, total coins, checked received (name on person who signed check, check number, amount), and income from other special ministries (Missions, Youth Ministry, Building Fund...) that would be also be included in the church deposit. The grand total of collections from the tithes and offerings should always match up with the deposit slip in your church bank account for that particular offering. 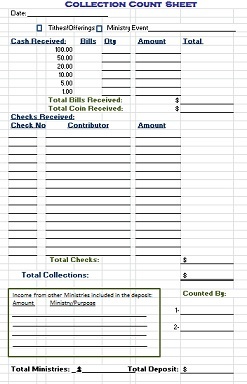 Return to Financial Forms from the Offering Count Sheet.